Ease your little one’s anxiety and create a sense of calm with the ThunderWunders Hemp Calming dog chews. These tasty, bite-sized bits help your dog chill during car rides, thunderstorms, fireworks, travel, vet visits and more—so you can spend less time struggling and more time snuggling. The unique combination of Thiamine, L-tryptophan and hemp seed oil helps to reduce anxiety and give your pup the chance to feel safe, loved and less-stressed. 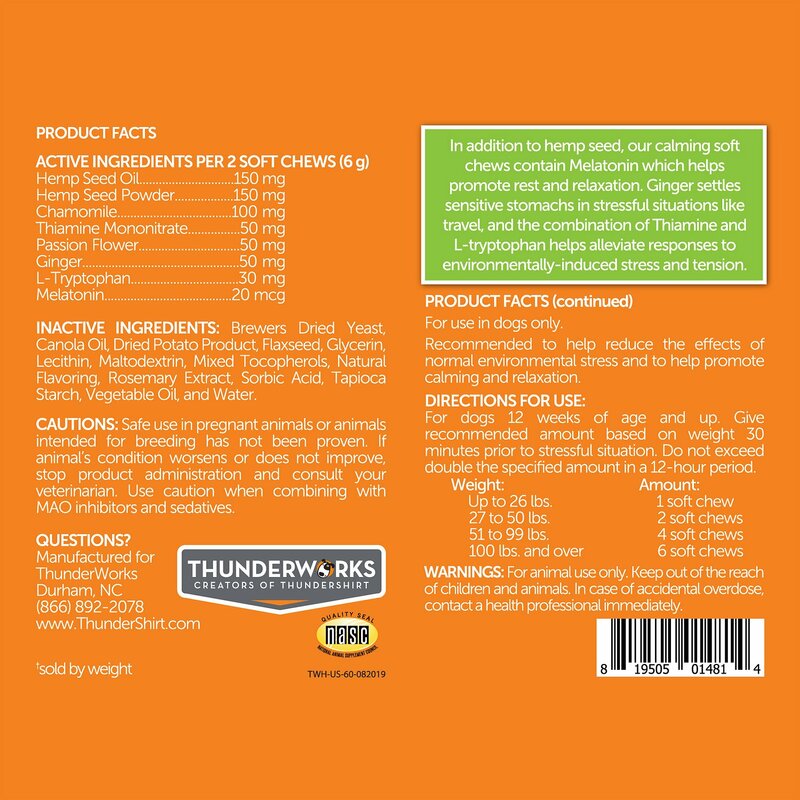 Plus, with added Melatonin, these chews also help to encourage rest and relaxation, while the power of ginger reduces those nervous tummy rumbles. It's the perfect way to soothe new, anxious and aggressive pets while preventing unwanted or destructive behaviors. Calm your dog with tasty chews that are perfect for traveling, grooming, thunderstorms, fireworks, or any other stressful event. Unique combination of hemp seed oil, Thiamine and L-tryptophan helps reduce stress and tension in dogs. 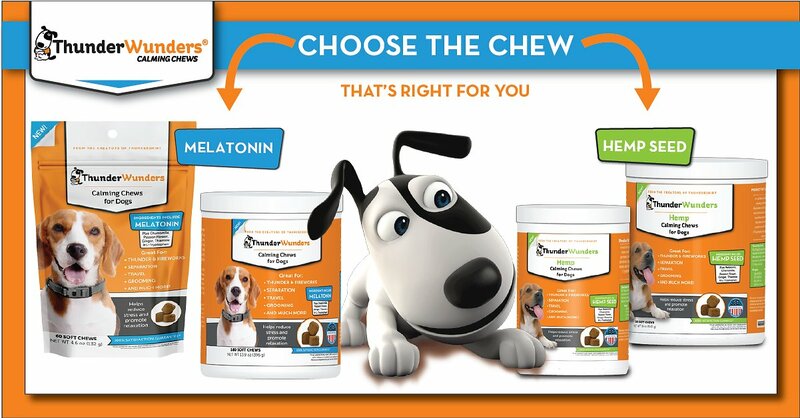 Melatonin, a natural sleep aid, is added to promote rest and relaxation. Added ginger supports sensitive stomachs, which can easily be aggravated by nerves and tension. Drug-free formula eases your pet’s stress without unwanted side-effects. For dogs 12 weeks of age and up. Do not exceed double the specified amount in a 12-hour period. / Safe use in pregnant animals or animals intended for breeding has not been proven. Caution with concomitant use of MOA inhibitors and sedatives. If any animal's condition worsens or does not improve, stop product administration and consultyour veterinarian. / Warnings: For animal use only. Keep out of reach of children and animals. In case of accidental overdose, contact a health professional immediately. 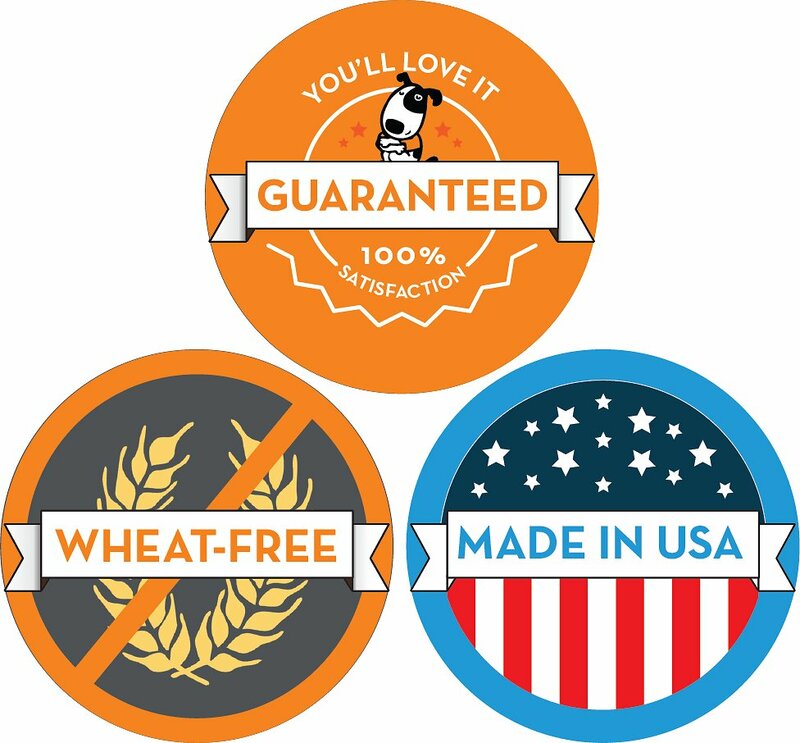 Due to the tasty nature of our products, do not leave package unattended around pets. 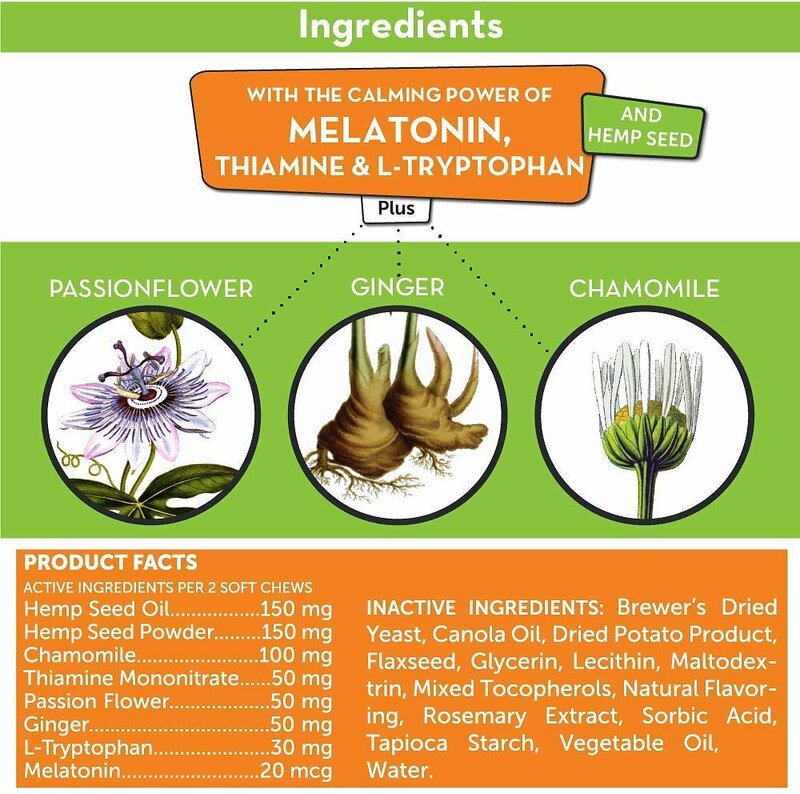 Chamomile, Thiamine Mononitrate, Passion Flower, Ginger, L-Tryptophan, Melatonin, Dried Brewer's Yeast, Canola Oil, Dried Potato Product, Flaxseed, Glycerin, Lecithin, Maltodextrin, Mixed Tocopherols, Natural Flavoring, Rosemary Extract, Sorbic Acid, Tapioca Starch, Vegetable Oil, Water. I tried the Thunder Wunder on my Jack Russell & Bloodhound. The Jack Russell took one the Bloodhound took four (acc. To recommended dosage). They were calmer. They didn’t pass out & sleep all day, But relaxed. They liked the taste too. They wanted more! I bought them to travel with the Bloodhound. I would & have recommended these! Chewy also got them to me in a couple days! Impressed. Happy customer. My dog reacted so positively to this product and calmed her down when she was starting to have a "panic" attack but it did not work as well as I would have thought when I had her groomed so will try to give her a little more than prescribed to see if that works. This really helped my pitbull's separation anxiety. I will say that for my dog it is best if I give an hour before leaving it seems to start working better than the half hour recommended. Its not a cure all but I can tell a BIG difference. I use this along the PET TUNES CANINE MUSIC box. When using both it seems to really calm my dog the most. 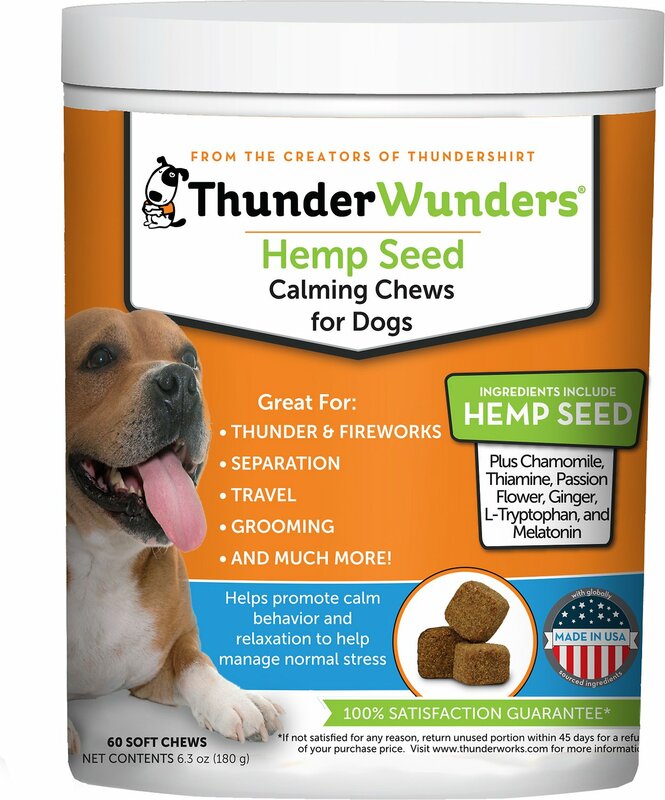 We love the ThunderWunders Hemp Calming Dog Chews, we have tried everything and lots of medications, but nothing has helped our little fur baby like these. The only problem is she will not eat them so we have to crush them up and add lots of peanut butter. I wish you could use some type of meat flavoring that would camoflage the ingredients that she smells and refused to eat. But with the peanut butter they have certainly helped her so much and we are so grateful. Not Chewy's fault but my dog won't take them cause he doesn't like the taste. I probably will have to resort to wrapping them in a bit of canned dog food. Should be easier....that said, don't know if they "work" yet. These worked well where other brand calming treats, thunder coat, and pheromone products where of little help. I ordered these for my 10 month old afraid of everything puppy. Her Thunder shirt actually does help her but I have not seen much effect from these treats. She does like them though. We have a senior anxious dog going blind and deaf. At night especially she becomes very agitated and these seem to help calm her. We’ve only used them a short time though. My dog loves the food, the service is great, the prices are with in range, she just doesnt eat as much as the makers recomend on the bag.